Many clients think hallmark of a good massage therapist is how much pressure they can use. I’d argue that the hallmark of a good massage therapist is how well they can assess and observe your tissue to determine the precise amount of pressure needed to create change. Anyone can use heavy pressure. It is not hard to place a bony elbow on a sensitive muscle group and lean in, or use the edge of a warm stone to strip a tender muscle. Sure those things can trigger a pain sensation, but that doesn’t mean they’ll do you any good. A gifted therapist knows WHEN to use heavy pressure and when a lighter touch is more beneficial. What takes skill is finding source of the pain and paying close attention to how muscles respond to different techniques, speeds, and pressures to determine what to try for the best result. And a therapist who has lots of techniques to try if their first attempt isn’t working. Think of a trigger point or “angry” spot in a muscle like a toddler who is throwing a tantrum. You can yell back all you want, but usually you’ll just exacerbate the tantrum. Same with “beating up” an already inflamed or tense muscle. Applying heavy pressure for the sake of applying heavy pressure may just further inflame the tissue which with most techniques, isn’t the goal. The best approach to a tantrum (or trigger point) is to stay calm. Instead of meeting aggression with aggression, a good therapist will calmly try to get to the root of the problem. It might take a bit of exploration from what seems obvious. For example, a tantrum in a grocery store might seem like it is about not getting a candy bar, but the root of the tantrum might be a missed nap. Just like a painful muscle in your calf might be caused by a tight muscle in your gluts. You never know if your first approach to calm a tantrum will work. Your massage therapist needs to make an educated assumption at the speed, pressure, or technique to try to relax a muscle or trigger point. If the muscle isn’t responding to one approach, a therapist will use his or her “listening skills” to gauge if the muscle needs a firmer OR lighter touch, a different position, or even a heat or cold application to encourage the desired response. Sometimes a heavy pressure is the answer, but not always. One reason people feel like a really painful massage is helpful is because the pain sensation can trigger an endorphin release. This can mask the pain in the short term, but won’t get to the root of the problem and the pain will most likely return. 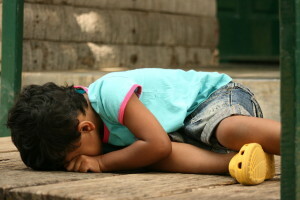 Like in a tantrum, sometimes moving away from the situation that has triggered the tantrum will help. In massage, sometimes moving the body to a new position on the table or incorporating a stretch or movement during treatment will coax the muscle into relaxing. I took a course from massage therapy pioneer and hall-of-famer, Ralph Stephens and he nailed it with the saying “You cannot inflict relaxation on a muscle.” Muscles need coaxing, not bullying. If you have questions about why your massage therapist is using the pressure they are using or whether more or less would be beneficial, please do speak up! Your feedback is important to help us work with you for the best result, but do understand that if you allow your therapist to do what they are trained to do, really “listen” to the muscle to find the approach that will work best in each situation, you will most likely have a better, longer lasting result. This entry was posted in Frequently Asked Questions, Massage Therapy and tagged Deep Pressure Massage, Does massage have to hurt?, Massage and Pain Relief by Cassie. Bookmark the permalink.